Moms are so smart. 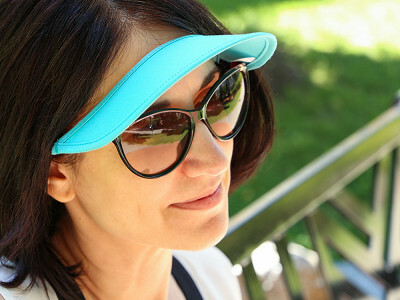 Rita Hockenbury thought up the Vizini strapless visor while squinting to see at her children’s sporting events. Visors that clamped on gave her headaches. Straps left her with a dent in her hair. And caps reduced her natural curls to a sweaty mess. Rita’s solution was Vizini, a strapless visor with loops you slide onto the arms of your glasses or sunglasses. Light and comfortable, Vizini barely touches your head. In fact, the first thing most people say when they try Vizini is, “I can’t even tell I have it on.” Today Vizini is a woman-owned company with a commitment to hiring disabled workers. The pride they take in their work is visible in the quality. For you, everything will be more visible because the sun won’t be in your eyes. Hello Grommet! I'm proud to introduce Vizini to The Grommet. I'd be happy to answer any questions you have! Hi there! I am so excited to launch here at The Grommet today. I love talking directly with (potential) customers. So, here we go. @Rita CAN MEN WEAR THEM TOO? @JEANNIE Absolutely! I do sell more to women, but men do wear them, too. What a wonderful idea! I have been looking for a nice looking visor that is light weight and will fit my apparently rather large head. And one that my curly hair won't get caught in the velcro. My question is: Is your visor stable enough to use while running? I am concerned that it might bounce up and down with each step, but absolutely love the concept. @Jennifer Thanks, Jennifer. The elastic loops on the underside will be tighter on a non-wire-framed glasses. Be sure to use both of the loops on either side for the most stable position. @Rita Thank you, Rita! I will definitely be giving them a try. Have they been tested while riding a bicycle or a motorcycle? @Barb Hi Barb, Yes to the bicycle--you are good to go. I am not sure about a motorcycle. I have not tested that yet, but that is a great idea. Since they attach to glasses, I know that Vizini does not interfere with a helmet, but I am not sure about the motorcycle's speed factor. @Tom Hi Tom, One thing I love about being a US manufacturer is that we can add to the line very quickly and easily. We do not have a camo right now, but are always open to new ideas and avenues. We are selling the Black and the Royal Blue which are frequently ordered by men. Thanks Tom. I could not find royal blue when trying to order. Are you out of that color? @Bonnie Hi Bonnie, Somehow your question came up in the middle of the question line up and I just found it above the 1:28 pm question. Yes, we did run out of Royal Blue today, but they are already on order. They should be back in stock within a few days. We had a dynamite day! @Rita Is it possible to have a logo on the visor or use an all-over print? Hi P, not at the moment, but it is certainly an opportunity in the future! I'll bet a lot of women golfers will love this! I know I'm getting one, and will probably gift some come Christmas time! @Martie Thanks, Martie. I know one golfer told me she loves that she can take both glasses and sun visor off together. And put them back on quickly after she hits the ball. How will it do if playing tennis or running? @Sheila Hi Sheila, We do sell to many tennis players, including myself!! With running, as long as you aren't wearing wire-framed glasses, it will be stable. Vizini is more stable, has a tighter hold, on other than the wire-framed glasses. The simplest ideas are ususally the best! This is genius! @Joan Thank you, Joan. It IS a simple idea! The elastic loops took me a while to "perfect", but Vizini is a simple idea. Can this visor be used with Oakley sunglasses? @Susan Hi Susan, If they have the rubber on the arms of the glasses then Vizini will not slide right on. You will have to "work it" on and off. We don't recommend Vizini for the tight fitting, wraparound type glasses. And we don't recommend Vizini for the frameless glasses as the arms are so very flexible. The elastic will stretch to accommodate an inch wide arm. I hope this helps. I'm a golfer and have just ordered one for myself to see how I like it. Great idea! 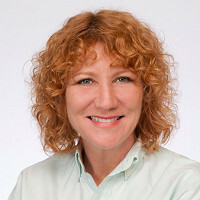 Hi Barbara, you can connect with our Customer Experience team here and they can help you out with bulk orders! @Jill Hi Jill, Yay NOVA! We don't have any locations yet but this is something that we are working toward. This seems like an ingenious idea!! Visors never work for me because as you mentioned they all give me headaches. I am excited to try this product and then share with my tennis friends but.... One very important question I have is, having bangs most baseball caps and visors just flatten my bangs down into my eyes. How do you wear this with bangs or will the visor fall at the bottom of the bangs? @Jodi Hi Jodi, I have bangs as well. Just pull your bangs out from under the visor, it they go under when you put it on. I like the visor closer to my glasses and my bangs just lie on top a little bit. If you pull the visor down on both sides as to hide the loops, it will bring the visor down to your glasses. @Rita Also, Jodi, try the different combination of loops. With some glasses, you only need to use the red loops and with others, usually the wide framed glasses, you only need the black loops. Using different loops effects how high it is on your forehead. This is written on the packaging as well. I have a retail jewelry & accessories store in New York City where I would like to carry this product. Can you tell me who I should contact for wholesale on this product..? Thanks! @kirti Hi Kirti, If you would scroll back up to the answer that Mike of the Grommet team provided to Barbara at 3:05, you will find a link in his answer to her regarding wholesale orders. Hopefully, you can click on the link as well. 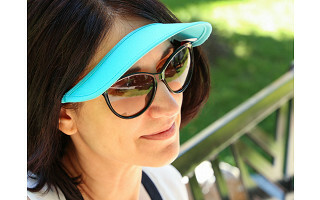 Rita Hockenbury thought up the Vizini strapless visor while squinting to see at her children’s sporting events. Visors that clamped on gave her headaches. Straps left her with a dent in her hair. And caps reduced her natural curls to a sweaty mess.